These wheels are used in gravity conveyors in special applications related to clearing sections, as guides or group mounted on the same spindle in straight or curved sections. Zinc-plated metallic wheels particularly strong, with cemented and hardened rolling surfaces. Polyamide wheels with red coloured external ring and black hubs; particularly suitable for corrosive, damp and food environments, also as low speed belt supports. Double race wheels particularly strong and noiseless. The external casing and the cage are in blue Polypropylene with zinc-plated and hardened hub. Under request we can supply them with stainless steel stud and balls, with white screen. This rubber ring can be assembled on the RSP 48 and RSR 130-131 wheels. This is particularly indicated to handle delicate or enamelled surfaces that must not be scratched. These wheels have Polypropylene casing, black . The bearing slides on two rows of balls over a zinc-plated steel stud which is suitably depressed and threaded with a screw slot to enable a simple and easy assembly. 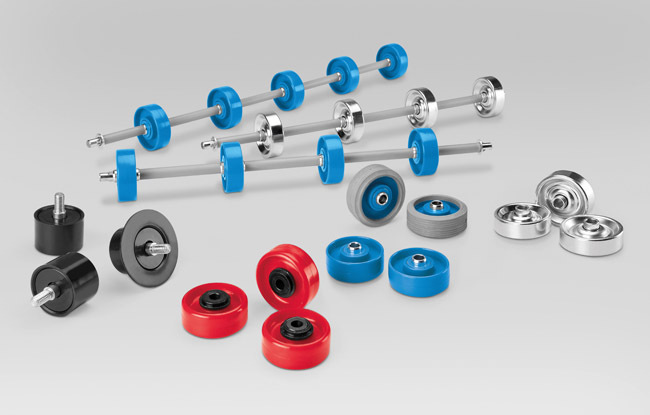 These wheels are ideal to handle quite rigid and fixed packages and are supplied with or without a containment rim; without rim they can be also installed vertically as control guides.